This post is in no way a reflection on Erin, my assigned blogger for the month, Debbi, the hostess for Group C, or April. Today is the day after our May reveal day, and I am browsing Making Memories With Your Kids, my Secret Recipe Club blog for June. April and Debbi made a special plan to get my assignment to me as we leave for overseas on the 23rd of May and no sooner have we got back than my parents arrive. I have one Sunday to get my assignment done and this month I do not want time to be against me. I must confess to finding blogger a very unfriendly user portal and so when looking for more about my assigned blogger all I could find is that she is a single mum to two kids and a school counselor. It sounds like Erin has a super fun time with her kids! I did not know where to start with choosing a recipe. Erin has been blogging since February 2010 and has a long list of labels I could choose from. I did my usual browsing to see if I could find an original recipe and when that did not work I went back to my fail safe method and typed the word pasta into the search block. That did not result in an original recipe either and I nearly wept. I am struggling with this part of the Secret Recipe Club and I know not all of my recipes are original, but I do try and post one original recipe a week. Between this aspect and the use of ready made ingredients I am seriously considering my future in the Secret Recipe Club. I see a lot of Ranch Dressing being used around the American blogs, and so I looked to see if Erin had a recipe for that – sadly not. So, I typed bread in the search function as I am in love with my sourdough and decided that no matter what, I would choose one recipe from this category and make it. 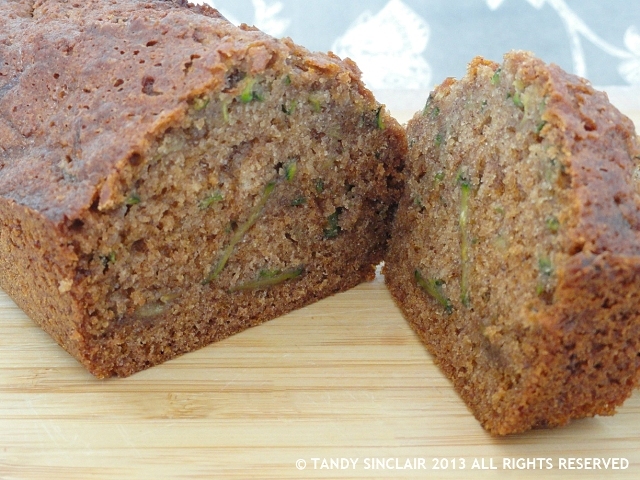 So, I will be making zucchini bread, or at least my adapted version of this recipe. We returned yesterday from Italy and I while I was away I made the decision to leave the Secret Recipe Club. It is time for me to venture into new things and grow my blog in a way that excites me. I am venturing into new challenges and I hope that you all will pop in and visit every now and then. I am so glad to have made great friends along the way while I have been a part of the Secret Recipe Club! Since I first wrote my post Erin has migrated to wordpress and the site is so much more user friendly. This weekend was nearly a disaster. On Friday I made the error of stirring the hooch into my sourdough starter. We have been away for 2 weeks and the hooch resulted in a strong vinegar smell taking over my lovely sourdough. I took a cup of this strong smelling starter out of my container and discarded the rest and hoped for the best. I fed my starter over a 24 hour period with one cup of bread flour and one cup of water and then took out another cup of starter and threw away what was left. I fed this batch again over the next 24 hours and I was so relieved that the starter smelled like sourdough rather than vinegar. 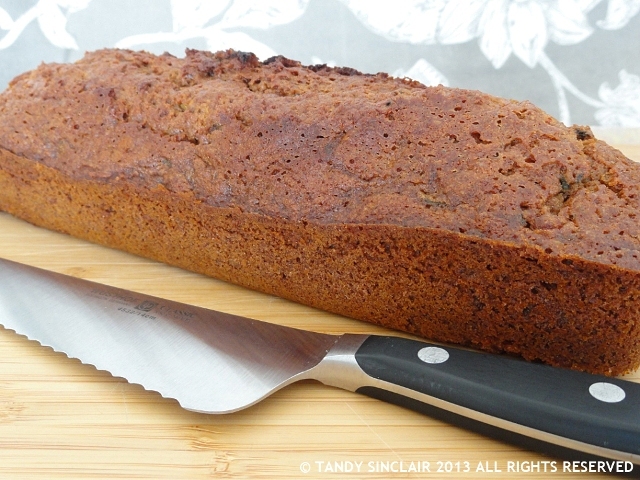 I proceeded to make this bread, which is more like a banana loaf bread than a savoury bread and I must say it is very tasty with the most wonderful crust. 0.625 g baking powder? I haven’t anything that would measure that – a teaspoon is about 5mL, or maybe 2.5g or so of baking powder – so this would be.. about 1/4 of a teaspoon? This bread looks delicious. I know you will be missed in SRC. I’m sorry you weren’t able to find anything on my blog that appealed to you. Your bread looks delicious. Oh Tandy, sad to see you go but totally understand when it’s time to move onto other things – I just feel lucky I got to “meet” you via SRC and will certainly keep up following your blog 🙂 Now l love zucchini quick bread and sourdough bread – so clever to do a mash up of both of them (despite your ‘challenges’) Good luck with your next ventures! Ouch! What an unkind post. I’m familiar with Erin’s blog and think she has a wonderful range of very creative recipes (and kid friendly crafts) to choose from. You couldn’t find an original recipe and “nearly wept.” Oh please, get over yourself. There are very few “original” recipes out there, even on your blog. I’m sorry you had such a hard go of it this month Tandy and very sad to see you leaving SRC. Understandable though 🙂 Your bread looks great and I hope to see you around from time to time! I have read somewhere that you can use raisin water to help a starter along but I am glad I did not have to try that! It is so tasty Usha! Hi Tandy. Sorry to hear you will leaving SRC. Wishing you the best with your blog! Welcome back, I hope you had a wonderful time. Thanks Tok, we had an amazing time! I am sorry to hear you will be leaving us. Good luck in all you do! I hope you still have a wonderful time blogging and finding what works the best for you in the future! Thank you so much! I am looking forward to what is coming my way but sad to be leaving the SRC! I’m delighted to have found Lavender and Lime on my first visit to SRC’s Group C. Now I can’t wait to browse your archives – crayfish first? maybe bread? ??? Looking forward to what you have planned Tandy. Me too Cin, it was awful!